Model Name: Cosmograph Daytona Paul Newman "John Player Special"
One of the most intriguing aspects of collecting vintage Rolex Daytona timepieces is the remarkable amount of aesthetic variety the line has to offer: one can find “standard” models and bejeweled models. Among the standard models, one can find the simple two color scheme dial in different variations (black, white, double Swiss, underline, small Daytona, Big Red, tropical registers….) and the Paul Newman dial also varies according to model, metal and year of production (three color, two color, Panda, champagne, Sotto….). While beauty is inherently subjective, few - if any - collectors will disagree with the statement that among such a variety of options, one of the most visually striking iterations of the Daytona is the one exemplified by the present timepiece: the John Player Special Paul Newman 6241. The alternation of black and gold details of the dial is perfectly reprised on the case with its gold sheen and pitch black bezel. Such a chromatic scheme - black with gold trimmings - is also found on Lotus race cars from the 1970s due to the sponsorship of the cigarette brand “John Player Special”, which was defined by those colors (actually the “JPS” color scheme being introduced in 1972). This is the origin of the JPS nickname. 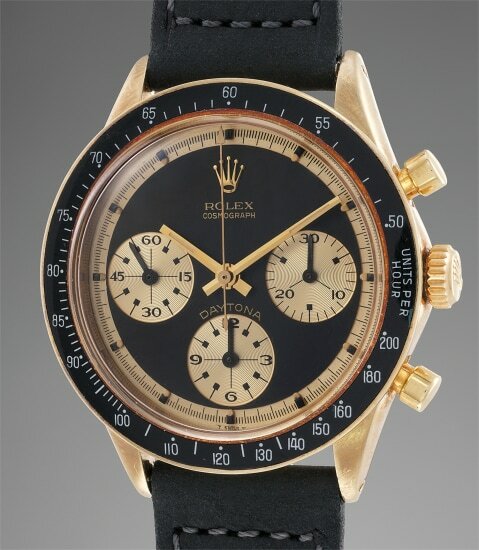 The present specimen represents by far the rarest iteration of the already spectacularly scarce JPS, as it is cased in 14K gold rather than the more usual 18K, most probably in an effort to abate taxation costs when importing the watches into some countries. Furthermore, it is offered in superior condition: the dial is as fresh as when it was originally made, still retaining all the luminous accents which aged to a champagne hue, in a remarkable strike of luck perfectly harmonizing with the outer track they sit upon. The “sing-a-song” Swiss designation is also absolutely flawless, showcasing sharp serifs. Representing one of the most visually arresting iterations in the entire Daytona (and possibly in the entire Rolex) production and offered in exceptional condition, this rare trophy will grant enormous satisfaction to its new lucky owner and - considering the depletion of the unknown Daytona reservoir over the recent years - it is highly unlikely that another 14K JPS in similar condition will ever again be discovered on the market. A truly perfect occasion for the collector of highly important wristwatches.